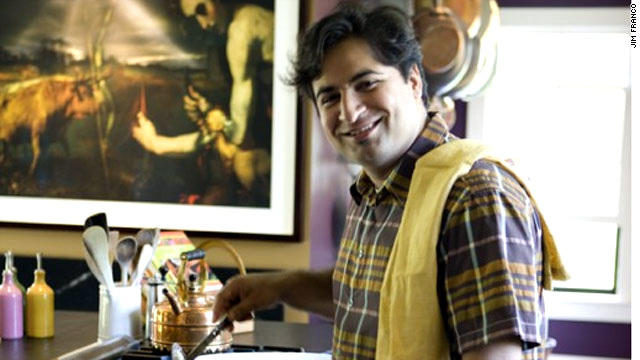 New Delhi-born Suvir Saran is the executive chef of Dévi restaurant in New York City. Editor's note: Tune in to "Hope Survives: 30 Years of AIDS," an AC360° special report beginning 9pm ET Friday. (CNN) - New Delhi-born Suvir Saran is the executive chef of Dévi restaurant in New York City, where his authentic Indian flavors earned one Michelin star in 2007 and 2008, as well as two stars from The New York Times and three stars from New York Magazine. He is also the author of "Indian Home Cooking: A Fresh Introduction to Indian Food, with More Than 150 Recipes" and "American Masala: 125 New Classics From My Home Kitchen." This is the first on a two-part interview with Saran on the subject of HIV/AIDS activism, the disease's impact on the food world and his personal life, his identity as an Indian and a gay man and the healing power of a good meal. How did food help you to connect to the community? After coming to the US, I started studies as a student of the visual arts and also working in retail. Each night I would cook dinners for friends and their friends. Each night brought new faces and new personalities into my world. A large number of those who came into my world in the early 90's were people that had been affected with HIV/AIDS personally and through loved ones. Seeing people one day and then hearing they had gone the next day or week or month, was one of the most difficult things to come to grips with. Often the foods I prepared at these parties would incite some awe, give comfort and solicit wonderful reactions. One guest exclaimed at one of the gatherings that he wished he could have a bowl of my rice pudding every night until he passed away. He was so young and so vital, yet he was being eaten away by this disease. I was not able to give him many bowls of the pudding before he was robbed from our world by the disease. This haunts me to this date. I feel terrible that I did not bring him a bowl each day. Another friend of mine, the proprietor of a great small cafe in NYC died of HIV/AIDS just a couple of years ago. His family again kept this a secret, or at the very least denied it. In doing so, they also kept us friends that knew this fact away from their son, who was also one of our dearest friends. This friend of mine had given me comfort and a warm welcome when I was new in the US. I cried for days and months and still shed tears when I grasp the fact that his family denied us his company and him ours. In living a lie they felt they had succeeded in some botched manner. But in doing so, they robbed their son, and those that loved him of contact that could have healed and given hope. While you are not HIV+, how would you address incorrect stigmas such as an HIV+ chef would transmit the disease to his patrons? Related: Visit Greater Than AIDS for answers to frequently asked questions about HIV/AIDS, as well as information about local testing centers.